This snakelike gallery ends with a tiny hole, the escape hatch for the native holly leafminer. Holly trees play a significant role in the beliefs and traditions of the season. To the Romans, hollies were the trees of the god Saturn and wreaths of holly were given as gifts during his holiday, Saturnalia. In Celtic legends, the evergreen hollies with their beautiful red berries announced the triumph of the Holly King during the winter season over the Oak King, who ruled the forest with his green leaves in the summer. For Christians, the pointed leaves of the holly are associated with the crown of thorns worn by Jesus and the bright red holly berries symbolize drops of his blood. Adult holly leafminers resemble small houseflies. But for a bug guy, this is the season to marvel at the native holly leafminer, a small wonder of the insect world. On my neighbor’s beautiful American holly, red fruits intermingle with deep green leaves. Some leaves bear unusual sinuous trails on their surface. Within the trails are the larvae of small flies known as the native holly leafminer, Phytomyza ilicicola. Back in the warmth of spring, the adult stage of the holly leafminer, a small black fly, pierced the surface of the holly leaf with a structure on the tip of its abdomen called an ovipositor. Peeling back the leaf surface reveals the tiny yellow holly leafminer larva feeding in the gallery. The fly then deposited an egg into the soft fleshy layer beneath the tough surface of the leaf. From the egg hatched a tiny larva that consumed the nutritious tissues found within the holly leaf between the upper and lower surfaces. As the larva snaked its way through the leaf, it created a meandering gallery, called a leaf-mine, which expanded and grew with each successive molt of the insect. On warm days during the winter and early spring, the leafminer will continue to feed until it completes development and forms a pupa in spring. Just before the larva changes into a pupa, it cuts a small window in the leaf’s surface to escape from the leaf when it becomes an adult. The emergence of the holly leafminer coincides precisely with the appearance of tender new leaves in spring. 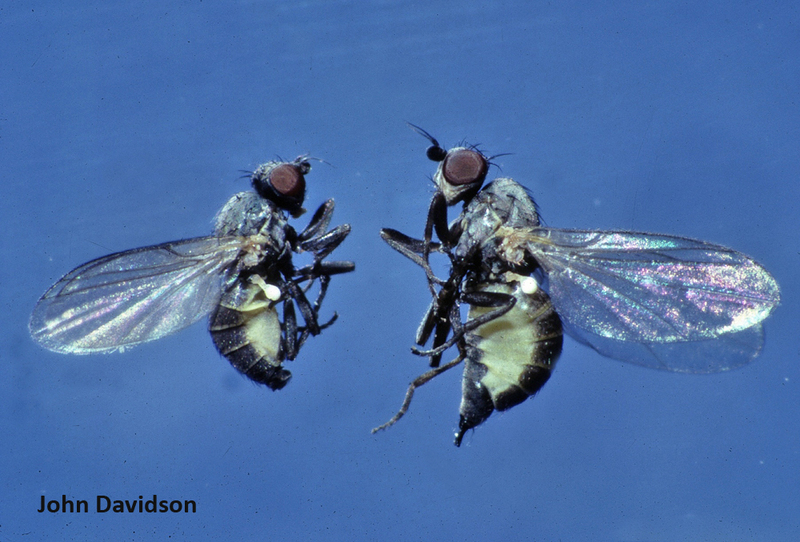 If the fly emerges too late, after leaves have expanded and become tough, the female fly will be unable to pierce the leaf with her ovipositor and her lineage will fail. Feeding punctures on the leaf surface may cause leaves to curl. I noticed several holly leaves bearing small punctures so numerous that their margins curled. One urban legend has it that small holes in holly leaves result when sharp spines of adjacent leaves bump into one another, but this is not the case. 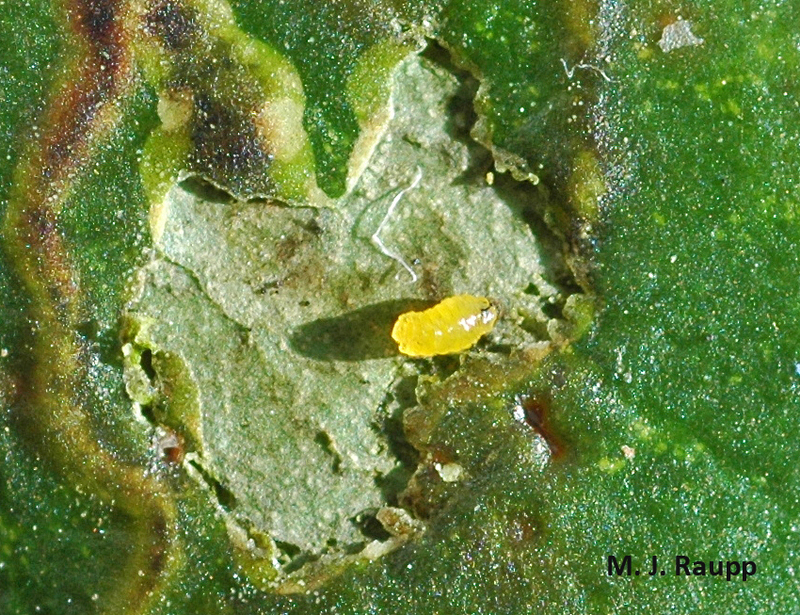 In addition to laying eggs, the female holly leafminer uses her sharp ovipositor to poke holes in the leaf’s surface. These small holes exude droplets of sap, thereby providing a source of food for the hungry female. All this may lead one to believe that hollies are completely at the mercy of these treacherous small flies, but this is not the case. 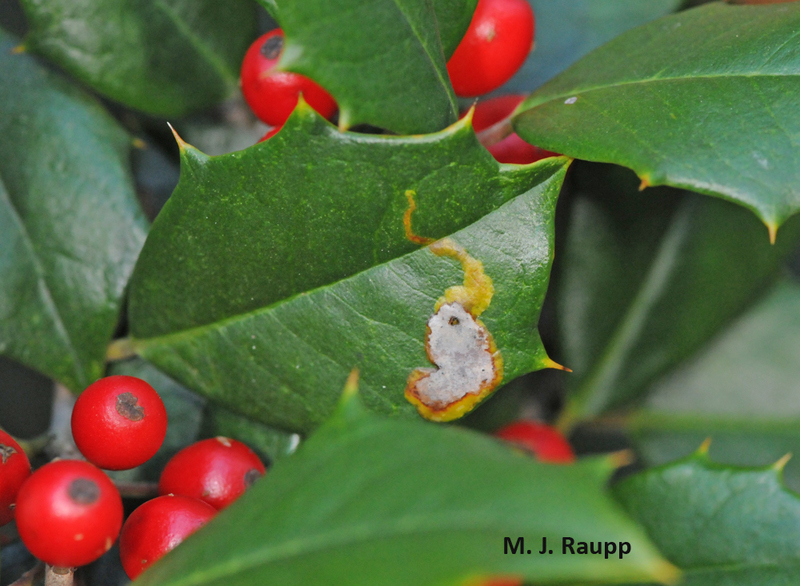 If leafminers become too abundant on a particular branch, the holly simply drops the infested leaves prematurely, thereby sending the undeveloped leafminers to a premature death as the leaf withers beneath the tree. With a bit of luck, the boughs of hollies that deck your halls may be all the jollier with an added surprise of holly-mining flies. Two fascinating articles “Population regulation of the native holly leafminer, Phytomyza ilicicola Loew (Diptera: Agromyzidae), on American holly” by Daniel A. Potter and “Seasonal allocation of defense investment in Ilex opaca Ation and constraints on a specialist leafminer “by D.A. Potter and T.W. Kimmerer, and the book “Managing Insects and Mites on Woody Landscape Plants by John Davidson and Michael Raupp” were used to prepare this episode.